Ich wünsch Dir ganz viel Spaß in Deinem neuen Nähzimmre mit dem super coolen Zuschneide Tisch! hihi, gerade über IKEA HACKERS entdeckt! I love this! I want one in my craft room! What size length were your wood screws? Awesome table. Thanks for sharing! I found this on Ikea Hacker and had to come over to tell you how much I love this! 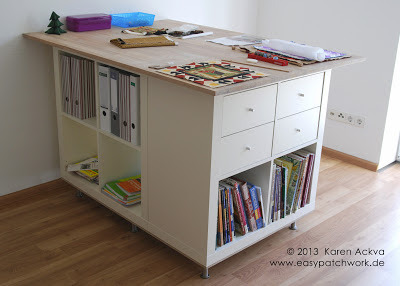 It is the perfect solution for a new craft room which is much smaller than my old one - due to number one son finishing university and moving back home. He didn't want the smaller room!!!! 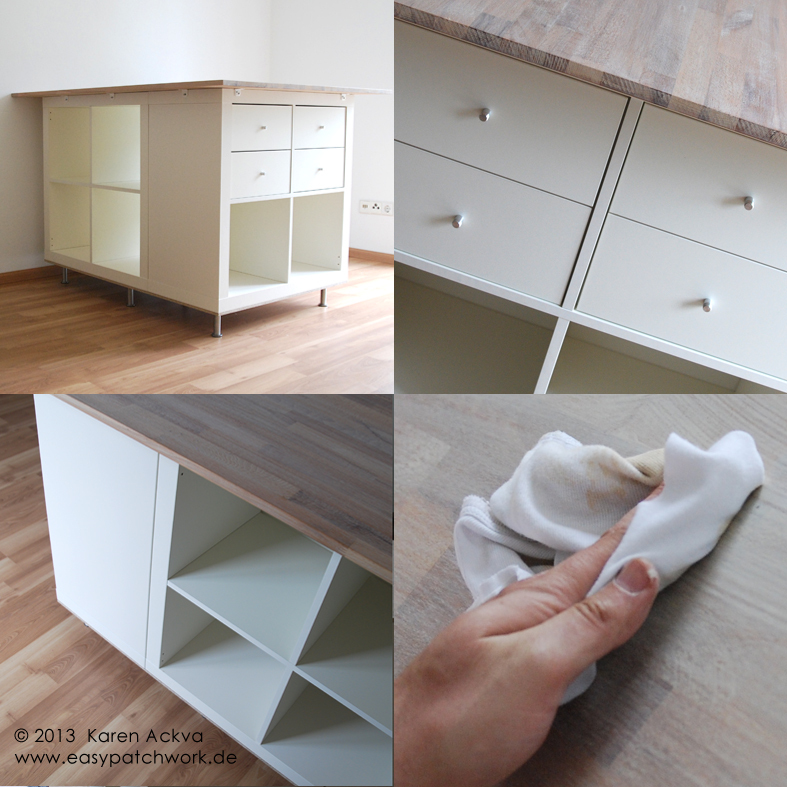 This one piece will allow me to combine 3 pieces of furniture so that is why I wanted to say thank you! It is a pity I don't have a 'handy man' (forget number one son, and number two also)! I hope I am able to 'do the work myself' when I have time to do this project! Love it. How wonderful. That is a dream to have such a large working usrface. Thanks for sharing. Hi- love your cutting table. Could you please tell me where you saw the original table made from 2x (2x4 Expedit book shelves) thank you. I love your cutting table! 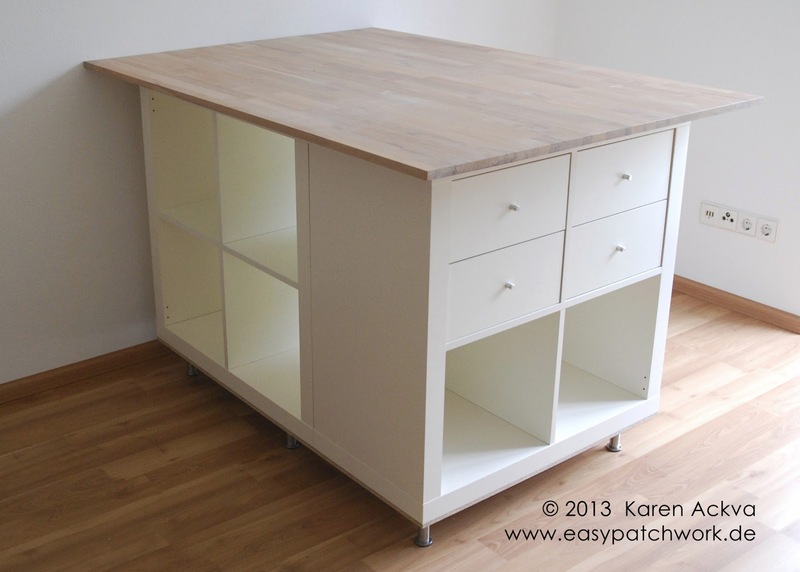 Perfect size for small sewing rooms. Did you use the Expedit white or high-gloss white shelving unit? darf ich Dich um eine Antwort bitten? Wie habt ihr herausgefunden, wo die nicht-hohlen Stellen der Seitenteile sind - wo also die Schrauben halten? Beim Bau haben wir gar nicht auf hohle Teile geachtet. Die Wanddicke sollte auch ihre 5mm haben. Wir haben 2cm Randabstand für die Schrauben eingehalten. Zum Verschrauben mit der Basisplatte haben wir ca. 30-40 dünne Holzschrauben verwendet. Beim Rumdrehen des Tisches (nachdem die Füße befestigt sind), muss man a) vorsichtig und b) mindestens zu zweit sein. Kurzzeitige Gefahr des Ausreißens. Zum Befestigen der Deckplatte mit Winkeln haben wir dann fette, kurze Schrauben genommen (Kerndurchmesser vorbohren!). Schrauben mit Gefühl anziehen. P.S. : Ich antworte gerne, aber hinterlasst doch bitte euren Namen, nicht anonym. Karen, thank you so much for sharing your desk project! We are moving soon and I am getting the Bonus room as my Craft Studio~ I do everything from scrapping to sewing, beading to painting, so you can imagine how excited (and grateful to hubby!) 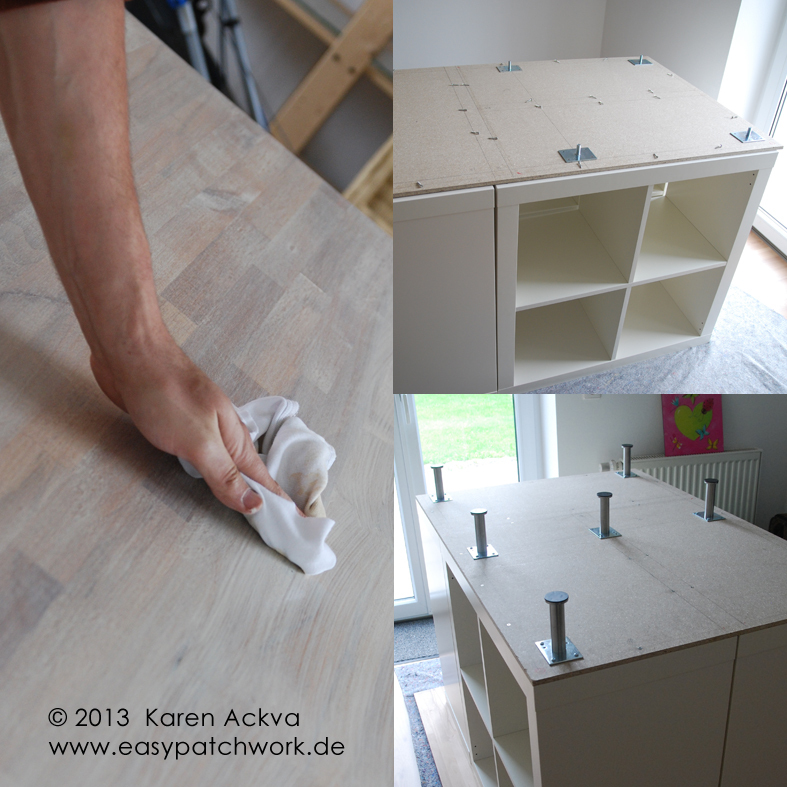 I am :) I've been searching for the "perfect" cutting table for a year and I'm going to Ikea next week for my supplies! Thanks again for your share! da habt ihr einen sehr schönen Tisch gebaut. Verrätst du mir, wo du die obere Platte gekauft hast?